Ensuring the safety of human life and property in buildings is one of the toughest demands that planners, builders, owners and operators are called upon to face. Smoke related injuries and deaths outnumber fire related injuries and deaths four to one. This is a rising concern for the safety of people and fire fighters who need to travel through building emergency exit routes as quickly as possible. 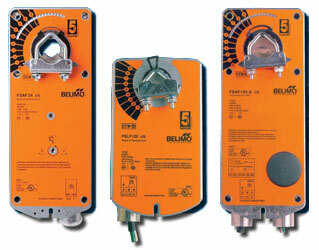 Belimo Fire and Smoke damper Actuators are UL873 or UL60730 listed. Belimo Actuators have UL555 & UL555S Listing by the damper manufacturer for 250°F or [350°] temperature rating. Actuators are UL2043 listed for low smoke generation in environmental air spaces and air moving plenums as required by NFPA 70, 300.22 (C) and the International Mechanical Code Section 602.2.1.4. Housings are either steel or plastic.